Human beings are animals that use tools, so they usually move with stuff not only in daily lives but also sports and artistic activities. By the way, what I have tried to make friends with is wooden sword. I’ll state what I noticed while I have gotten along with a wooden sword. First, I must be independent. When you hold a sword, you tend to focus on only holding it and be careless that “you are standing”. So, you should care about yourself standing stably on the ground. It is better to prepare for moving to anywhere anytime with a moderate strain. Second, I must be conscious to not parts of it but the entire. If you are not used to hold long object like a sword, it is usual to chafe the floor or the ceiling with the tip of it because you cannot grasp the real length. If you stand and hold it with being conscious from the root to the tip, your body will be stabled only because of it. Condition1 and 2 are compatible. Finally, the relation between I and it must be not one-sided but interaction. 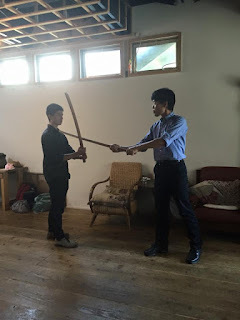 When you hold and move a sword several minutes, the relation gradually becomes “the primary and the subordinate”. From “you and the sword move (S-Vi)” to “you move the sword (S-Vt-O)”. Looking back, there are several points that can be helpful in order to make friends with living human as well as a wooden sword. “Being independent”, “being conscious to entire”, and “interaction” are important to make friends in real life. Therefore, we should not look down on the ability to make friends with stuff. For example, I don’t think tennis players who throw their racket when they fail can be gentle. On the contrary, a person who treat stuff gently tend to be regarded as gentle. If every stuff has mind, it will take to gentle people rather than irritable people. I felt glad to find out that we can learn the skill to become gentle by swinging a wooden sword, a wild movement at first sight.